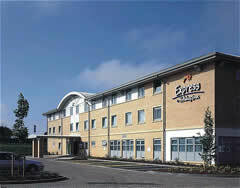 It has never been easier to find the perfect East Midlands Airport hotel for your requirements. Here at UKACP we have a great selection of hotels for you to choose from. Are you looking for a family friendly hotel? Perhaps you want a hotel that is in close proximity to the airport? Whatever your needs may be, you can be confident that UKACP can cater to them. If you book an airport hotel through our website you will benefit from a whole host of perks. 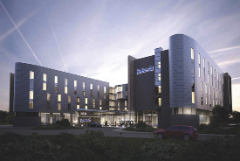 You can easily book an East Midlands Airport hotel with parking, as well as other extras. Our search feature makes it easy for you to find the hotel you require. All you need to do is pop in your details and we will display the best options for you. It really is as simple as that! Ready to book? Great news! Follow a few easy steps and we will email you the confirmation. You will need to take it with you. So print it out and keep it with your passports so you don’t forget. Go on, spoil yourself! The Best Western Premier Yew Lodge is ideal for those with a taste for luxury. It has an award-winning spa and restaurant and it is set in landscaped gardens. You can certainly make sure you are pampered and relaxed for your vacation. The good news does not end there either – if you book through UKACP/Holiday Extras you will save almost 50 per cent on a continental breakfast. 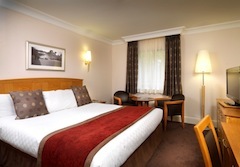 East Midlands Hilton is an example of a good family hotel near to East Midlands Airport. It is about ten minutes away and is popular amongst those families looking for an East Midlands Airport hotel. They have a heated swimming pool, sauna room and steam room, excellent restaurants with themed menus and sometimes a buffet for those picky eaters! The Holiday Inn Express is ideal if you have an early start. Guests can enjoy a free hot breakfast from as early as 4 am. Fill your tummy before your busy day of travelling! The hotel also has a transfer bus service to take you straight to the airport. Don't forget that if you decide not to stay in a hotel the night before you fly you can still save money on our East Midlands airport parking packages. We will always save you anything from 15 to 60% compared to the car park gate price.